With 21 screens, a covered outdoor area and live music most weekends, this might just be the ultimate sports bar. 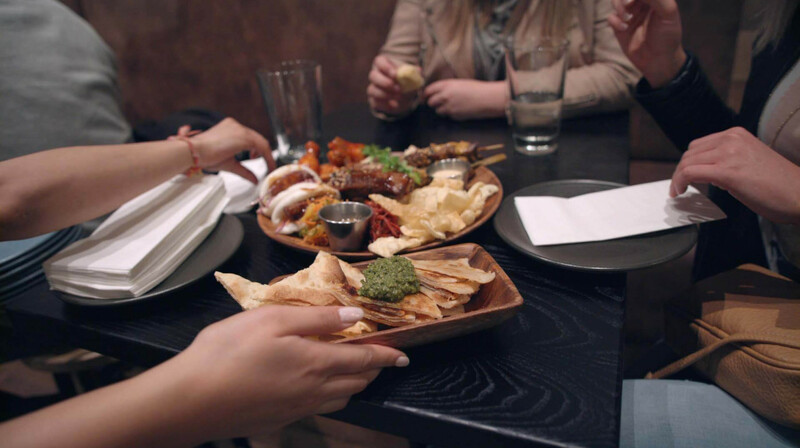 Expect a friendly atmosphere, cozy booths and an apparently endless supply of good vibes. And as if that isn’t enough of a reason to visit, they round it all off with mouthwatering food. Expect big flavours such as the succulent beef burger, crispy fish with hand-cut chips and their famous pork belly with it's authentic Asian flavours. The impressive sharing meat platter will have any carnivore hurrying back, whether they’re a sports fan or not. It’s laden with pickles, fried chicken, BBQ ribs, meat balls, wedges, slider buns and a selection of tasty sauces. 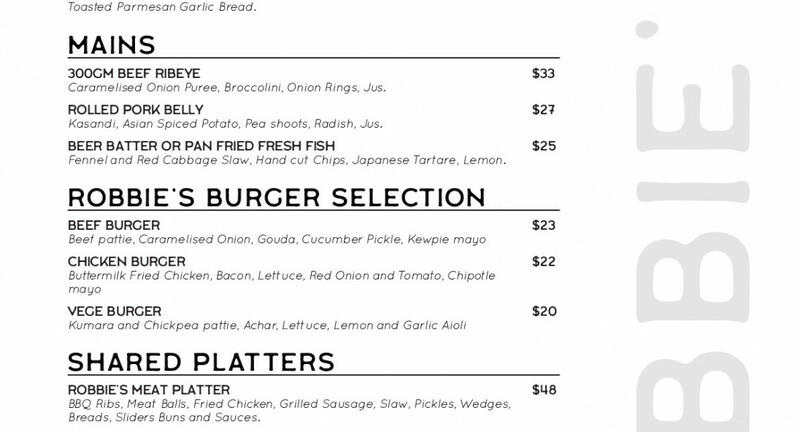 And there’s plenty for veggies to get excited about too, including the delicious vege burger. 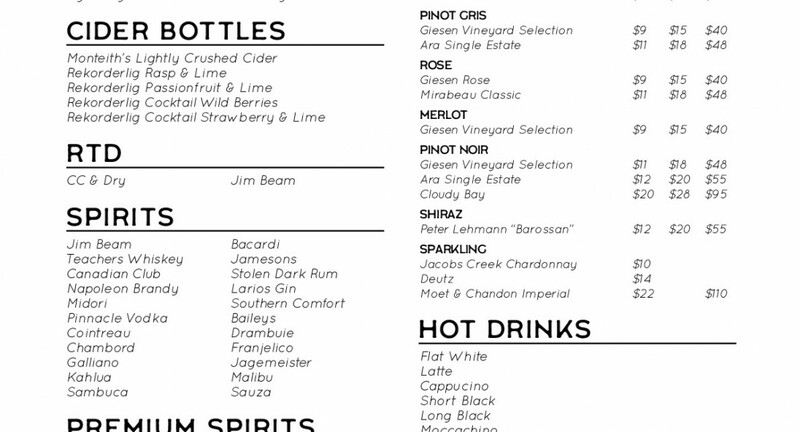 When it comes to drinks, your spoilt for choice. 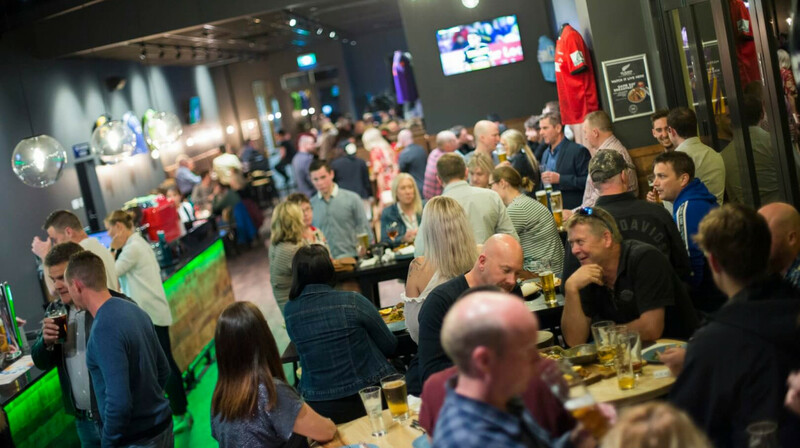 A huge selection of beer, cider, and wines will keep you hydrated throughout the match and long into the night, as you dance to the beat of top local bands. 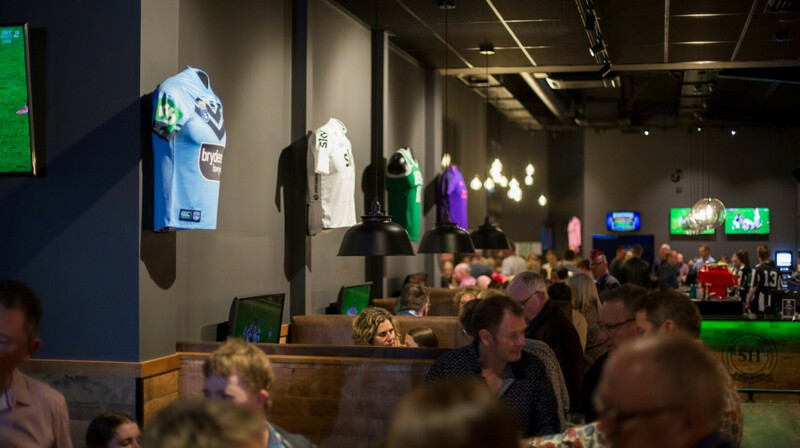 Robbie's Riccarton - your local, great food, live sport! Great food and service, will be back! Very good service and food- although rather large meals. Also nice live music while we were there. Fantastic location, surroundings. 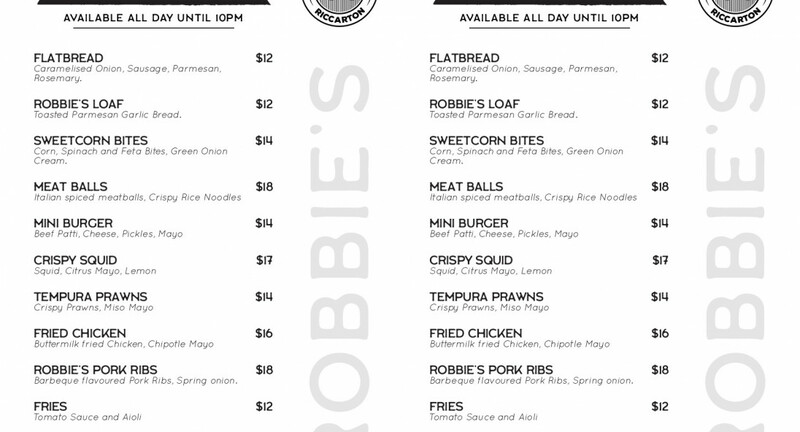 Wouldn't have known Robbies was in a new location without first table. Will definitely go back! Pleasant atmosphere sitting on street side except for smokers smoke drifting through restaurant. Food good, limited choice of food. Lovely experience, the service was amazing very pleasant and willing to change what my daughter had in her burger with no fuss and insured they got it right which was muchly appreciated food was amazing we were so full! The only difference we noticed was that there wasn’t a whole heap of variety of foods compared to what robbies used to have. Great place. Great food - steak was excellent,, best we have had. It was a great change to have no loud music - we keep entertained by the many televisions around, with varying sports on, one even at our table. 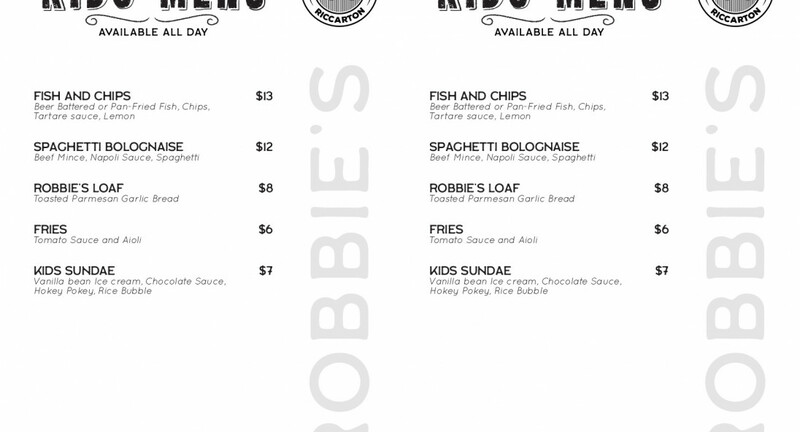 So pleased First Table listed Robbies, as we had no idea it was nearby. Such a great set-up so hope others discover Robbies Riccarton. Nice relaxed atmosphere, friendly staff and a good variety on menu. What amazing food! Ribs were perfect, the sauce that was on it was to die for!! - we saved the plate to dip our fries in it! And the chicken burger was just DELICIOUS! And to top it off the guy serving us was awesome! checked up on us often and made sure we were ordering when we were ready. The only downfall was when a big group of people came in very loud and ruined the chill atmosphere and we decided to leave but that wasn't the restaurants fault. Will definitely be back for more!! The food was good. Though it wasn't a big menu there were more than one choices for vegetarians and also gluten free options on the kids menu. Couldn't be more impressed by the fast and personable service. I will be returning.